The Carolina Coach with some haunted history! 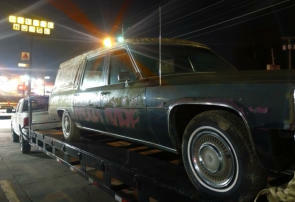 Vera is an 1984 Cadillac Fleetwood Funeral coach that has Spent it’s entire life in the southeast. this will be an on going project for fear Carolina. 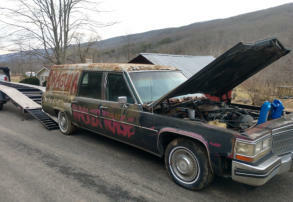 when Completed, Vera will be used to promote the haunt and horror industry in the Carolina’s. Haunt promotion is nothing new to this coach, Vera spent some time at the Hacker House in pilot mountain NC as one of their promotional vehicles for a number of years around the turn of the century before finding its way into Virginia. 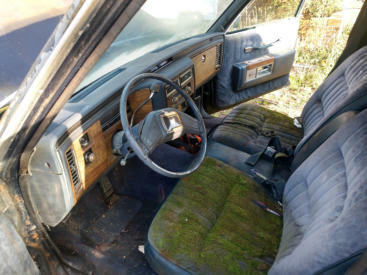 the condition of this project when started would have made many run in fear, but fear is what keeps us going! We have some great sponsors lining up to help us out and we’ll post updates and videos along the way. heres a few shots of the trip home! Fear Carolina through Vera and all her sponsors would also like to remind you that a really scary thing is is taking the lives of drivers young and old all across the Carolina’s each day at an alarming rate. No one is safe from a distracted driver. no matter who it is, no matter what it is. it can wait! Driver distraction is responsible for an estimated 58% OF TEEN ACCIDENTS AND ON AVERAGE AROUND 5,000 PEOPLE LOSE THEIR LIFE DUE TO CARELESS MISTAKES made on the road annually. Don’t be a statistic, Pay attention when you drive to stay alive! Special thanks to Carpenter Transport for the Haul home! More updates as the work begins! Update: 4-1-19 Monstaliner, the most advanced Liner coating company in the world has agreed to help vera get a little color back! We look forward to showcasing what their products are capable of! Stay Tuned, Videos and more coming soon as we take you along for the ride!